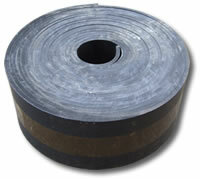 We supply flat back and insertion rubber strip on the roll in standard lengths or cut to size. For further information please contact Trevor on 01733 894949. Ideal for damp proofing, draught proofing, as door seals or for coil fed converting systems such as presses or gaskets.